In the decades since the collapse of Yugoslavia, Belgrade has been reviving its status as one of Europe’s most vibrant and feistiest cities. At times during my short visit it felt like a giant urban experiment: dull Soviet-style blocks, elaborate Austro-Hungarian palaces, traditional Balkan taverns, alternative clubs and Byzantine churches form an irresistible Balkan melting pot. Belgrade might not be as aesthetically charming as other European capitals, but it seduced me with its audacious, sometimes schizophrenic character. The first thing that struck me about Belgrade was the green. I didn’t expect so much of it in a metropolis of more than 1.5 million people—and with a socialist past, no less. Post-communist cities are not usually renowned for their colour and vibrancy. What makes the difference perhaps is the presence of not one, but two large rivers—the Sava and the Danube—whose banks are almost entirely covered by parks and forests. In the riverbeds there are even two islands: Great War Island, an uninhabited natural oasis for river flora and fauna, and the popular Ada Ciganlija, which has been transformed into a recreational area with beaches and sports facilities. 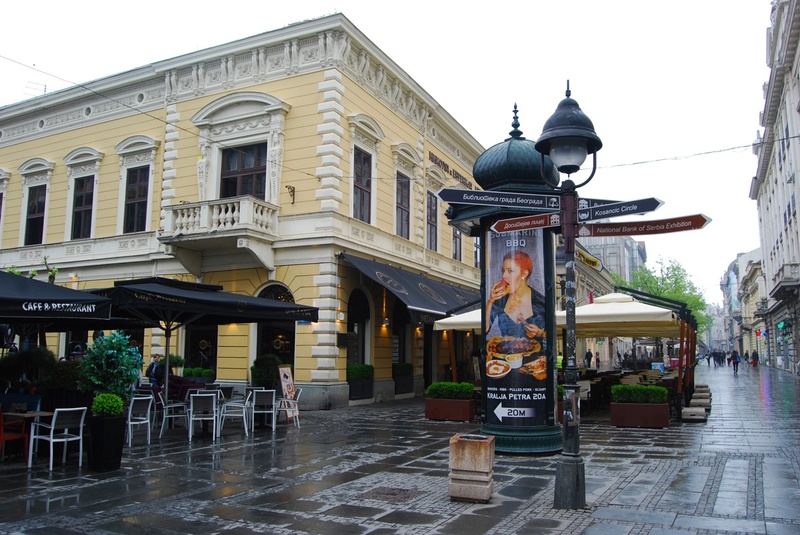 Knez Mihailova, Belgrade’s pedestrian-only downtown core. For my short stay I booked a flat in Dorćol, a central neighbourhood with a cosmopolitan past. Serbs, Turks, Greeks, Jews and Germans used to live side by side in these streets; even before becoming the capital of the Socialist Federal Republic of Yugoslavia, Belgrade had been occupied and fought over by Celts, Romans, Slavs, Turks and Austro-Hungarians. Very little of this cultural diversity remains in today’s Dorćol apart from its Turkish-derived name (dört yol means “four roads”), as well as an Ottoman tomb and the Bajrakli Mosque—the last functioning mosque in the city. Today Dorćol is a pleasant residential area, full of fashionable bars and restaurants, where you can taste all sorts of local food—a balanced mix of Mediterranean, Balkan and Central European flavors. In addition to the ever-present ćevapi and pljeskavica that I enjoyed so much in Sarajevo, you can find soups made with fresh local vegetables and cured meats that I miss in Istanbul. Foodies should also check out the colourful stalls of the covered Zeleni Venac market, animated by wizened vendors and buyers. The colourful roofs of Zeleni Venac are impossible to miss. At a mere five-minute walk from my apartment, bustling Republic Square constitutes the heart of Belgrade. It is surrounded by impressive buildings such as the National Theater and the National Museum of Serbia, in front of which groups of youngsters hang out during all hours of the day. The square gives way to the pedestrian Knez Mihailova Street, the city’s so-called “living room,” lined with luxury shops and fine outdoor cafés. While strolling along the street, my eyes were drawn up to admire the buildings’ splendid architecture, reminiscent of Belgrade’s older glorious days. Knez Mihailova leads straight to Kalemegdan Park (from the Turkish words for “castle” and “square”), arguably the city’s largest tourist attraction. It’s a huge fortress whose massive walls contain not just the namesake park, but also moats, towers, tombs, museums, churches and monuments, mementos of the city’s different rulers. 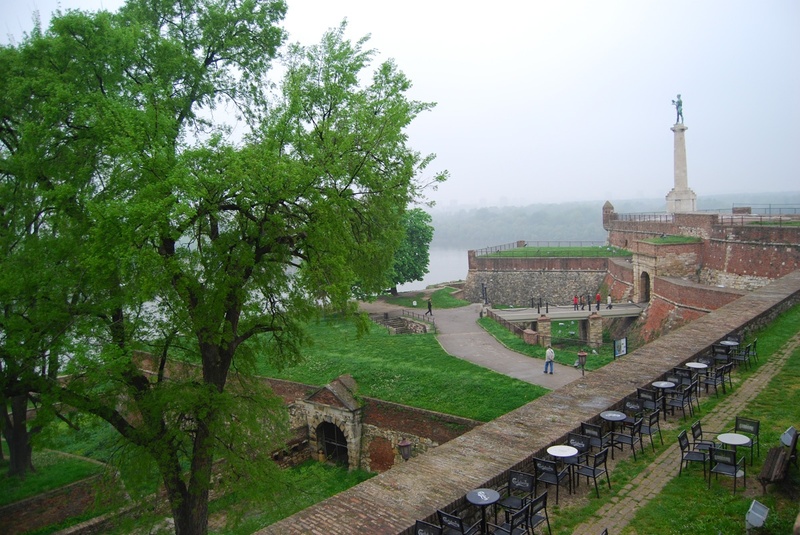 Exploring Kalemegdan is like walking through Belgrade’s turbulent past. The centrepiece, however, is the old citadel, perched atop a hill overlooking the confluence of the rivers. Even on a grey and foggy day, the view is stunning. A foggy view from Belgrade Fortress. 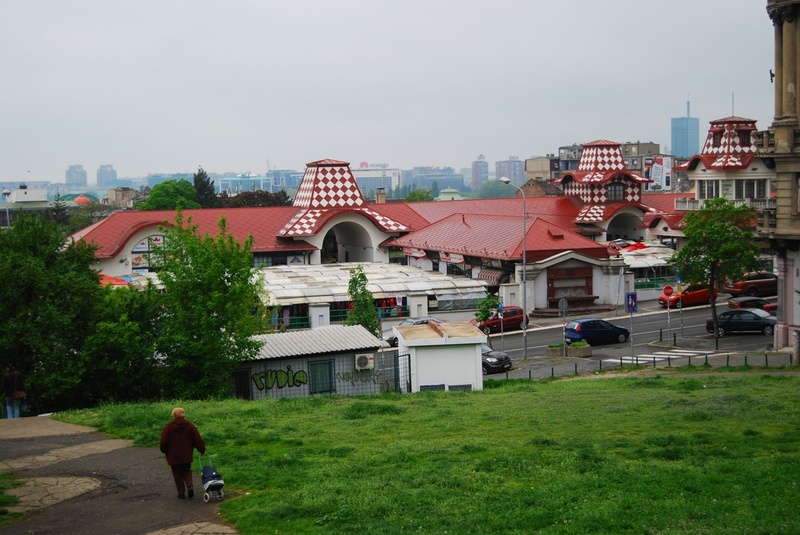 As with any worthwhile capital, Belgrade boasts dozens of museums and art galleries. I managed to visit only two, but can recommend both of them. The small but engrossing Nikola Tesla Museum is housed in a residential villa in the centre; its few rooms have on display personal objects belonged to the great Serbian scientist, including a metal sphere containing his ashes. Far more interesting are the models of some of his inventions, which you can see in action by joining the guided tour. A bit farther out of the way, but still easily reachable by public transport, is Marshal Tito’s grave, officially known as the House of Flowers. The mausoleum and the nearby Museum of Yugoslav History are plunged into a quiet park, embellished by statues and flowers. As in the Tesla Museum, the guided tour was informative and engaging, and offered a lot on the life of this famous world leader and how the perception of him by the Yugoslav people has changed over time. Throughout my stay I never felt like Belgrade was a chaotic city. Whenever you feel stifled, you can always head to the rivers. What’s Belgrade’s most iconic landmark? If we were to judge only by size, there would be no challenge. With its gargantuan bulk, the Church of Saint Sava is one of the largest Orthodox churches in the world. Its white, domed megastructure dominates the city skyline and can be spotted from nearly everywhere. The temple—still unfinished even though construction began in 1985—is dedicated to Serbia’s patron saint, the founder of the Serbian Orthodox Church. Once finished, the interior will be covered with glittering golden mosaics; yet even now, completely bare, it doesn’t fail to inspire awe in visitors’ hearts. Other remarkable buildings to check out, although more modest in scale, are St. Michael’s Cathedral, St. Mark’s Church, the parliament building and the central post office, a typical example of Soviet architecture. 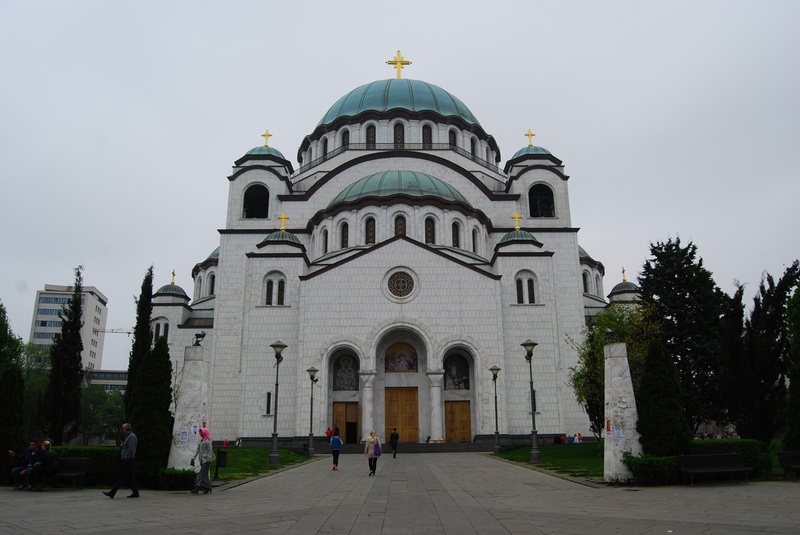 The epic Church of Saint Sava, one of the world’s largest Orthodox churches. Throughout my stay I never felt like Belgrade was a chaotic city. Whenever you feel stifled, you can always head to the rivers. The historic town of Zemun, across the river from Belgrade’s historic downtown, is a perfect escape from the crowds. 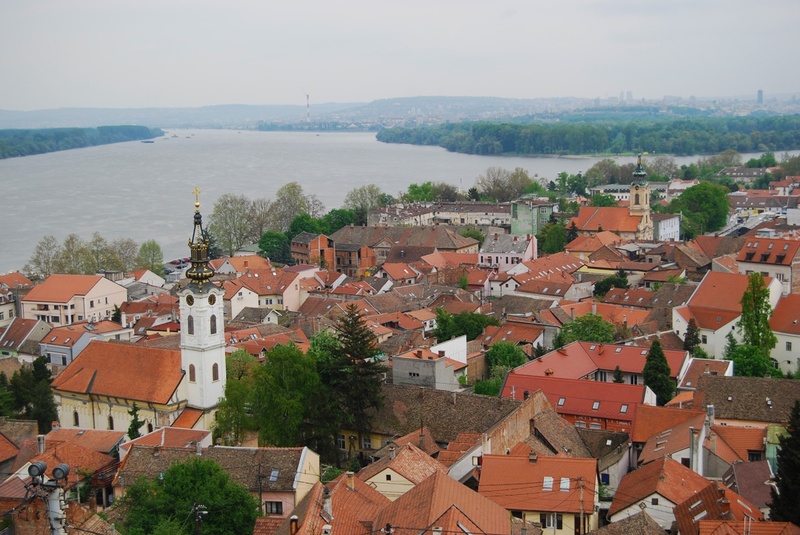 Gardoš Hill, in the heart of Zemun, looks like a medieval town frozen in time: pitched red roofs, a maze of pebbled alleys, old churches and the Millennium Tower, from which I enjoyed a beautiful panorama over the city and the Danube. Along the riverside there are some pretty cafés and the best seafood restaurants in town. I cannot end this picture of Belgrade without mentioning its amazing people and nightlife. Every night is a Friday night, and there’s an embarrassing wealth of choices for clubs and bars. In the summer months, some boats on the rivers turn into floating discos! For some less extreme fun, you can go to Skadarlija, a central bohemian neighbourhood full of charming bars where drinks and meals are consumed against a background of live Roma music. 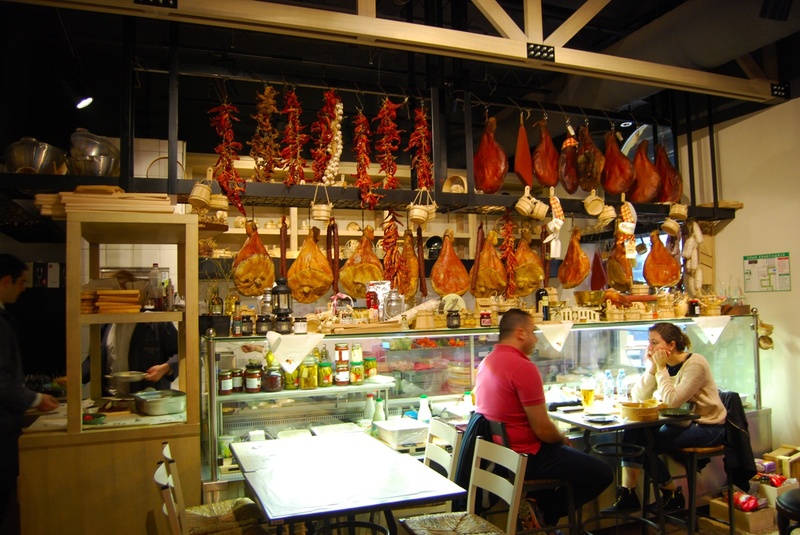 A typical Serbian scene: A little gloom, a lot of meat. Serbs themselves are a bit crazy, but in a good way. The ones I had the chance to talk with were pessimistic about the country’s economic and political situation, but made perfect hosts the rest of the time: at night, they were full of life and ready to party; during the day, they were easygoing and friendly. Only one quality remained consistent: Wherever you go, you won’t fail to notice how good looking Serbian people are. That’s certainly one more reason to visit!